School Loop uses LDAP to create a secure authentication process with your directory services (for instance, Active Directory). Via a secure web service, users will log in with the username and password assigned by you. All policies and practices relating to usernames and passwords are managed through your directory services. An added benefit is that each time a user logs in to School Loop using their Active Directory credentials, their first name, last name, email address, and login name listed in their School Loop account automatically syncs with their AD account. This syncing also occurs whenever the activate user list (discussed below) is opened. For student accounts, there is an option to disable syncing of email addresses, which allows students to use an email address of their choosing with their School Loop account. The secure User Web Service that is installed on a district server acts as an intermediary between School Loop and the district's Directory Services server. School Loop can query the web service for username and password authentication, and the web service will respond with "true" or "false" as to whether those login credentials are correct. Prior to this authentication, however, Directory Service users must be "activated" in the School Loop system, via the Activate Users interface. Teacher, Student, and Staff users are activated separately, and each group of users has its own activation page. The activation page for teachers queries the web service for all Directory Service users whose "department code" matches the school code. Each matched user's employee ID is then compared to the teacher IDs from the latest data import from your Student Information System (data importing from the SIS is a separate process known as Sloopy). Users whose employee ID attributes match a known teacher ID are then displayed for activation. Student users are matched similarly using the student ID attribute. No ID number is imported for any other staff, so those users are matched by username. If the username is already activated in School Loop in a staff role, that user's account is synchronized with your Directory Service; once synchronized, the user must use their Directory Service password to login (the local School Loop password will no longer work). If the username is not active or does not exist, the user is presented with a drop-down list of roles; selecting a role and clicking submit activates the user account. If the username already exists in a non-staff role (for example a parent user), a warning message is displayed and no action is taken. Employee IDs: Teachers and Students must have their unique district teacher ID or student ID entered as an attribute in Directory Service. By default we use the "employeeid" attribute, but any attribute can be used. Department Code: All Directory Service users must have a "department" value. By default we use the "department" attribute, but any attribute can be used as long as the same attribute is used consistently across the district. For school users, this code must be the district school code for the school. For district offices, this can be any unique value that is not a school code. 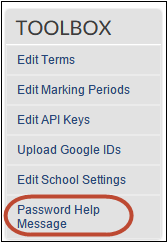 School Loop can be configured with multiple department code values for a district office site. Domain Names: School Loop will search a specified list of Directory Service domain names for users. If the district uses multiple domain names for users at the same school, please ensure that all user names are unique. In the case of duplicate usernames, the first user activated will receive that name, but the other user will be presented with a conflict message in the activation page. userPrincipalName: The userPrincipalName attribute contains the user name that will be used in School Loop, follow by @domainname. For example for userPrincipalName "SmithJ@district.k12.org", the resulting School Loop user name will be "smithj". (School Loop login is not case-sensitive). Make sure java JRE 5 or better is installed on the web server and the path to the java bin folder is in your system PATH variable. Download and unzip the Web Service distribution. This consists of a "dist" folder with all of the necessary files to configure and run the web service (download link provided by School Loop). The path at the end of that command is used to place the keystore file in the security folder which is inside the dist folder. It may be easiest to specify the full path to this location. Optionally, but recommended, create a Truststore if using SSL to connect web service to the LDAP server. Open a command prompt and type: java InstallCert your-AD-server-ipAddress-goes-here:636 (when prompted, hit return). Edit the LdapApp.properties file in the "dist" folder to adjust the provider url, AD login, web-service port, and the keystore file as necessary (details below). Open a command prompt and change directory to the "dist" folder. Start the service with the "run" command file in the dist folder. The recommended configuration is to install in a DMZ, with the Directory Services server in a secure zone. School Loop communication with the user-web service is secure, over SSL. Therefore, it is necessary to create a keystore (if one doesn't exist) on the User Web Service server. Optionally, if secure SSL communication is desired between the Web server and the Directory Services server, a truststore needs to be created as well. Change the providerURL property in LdapApp.properties to use "ldaps://" instead of "ldap://" and change the port to 636. Firewall Configuration: For optimum security, the web server firewall should be configured to allow incoming traffic to the web-service's IP and port only when the traffic origin is from the School Loop system. (IP address listed in documentation sent to district network engineers). Redundancy: School Loop highly recommends that an alternate web-service be installed on an additional server (or servers) so that in case one web-server is down for maintenance or due to failure, your user's login authentication will not be interrupted. School Loop’s Directory Services configuration allows any number of web-services to be running simultaneously, and will automatically try successive servers in case of connection failure. Search Base: The domain(s) for the district users (e.g. "district.k12.org"). 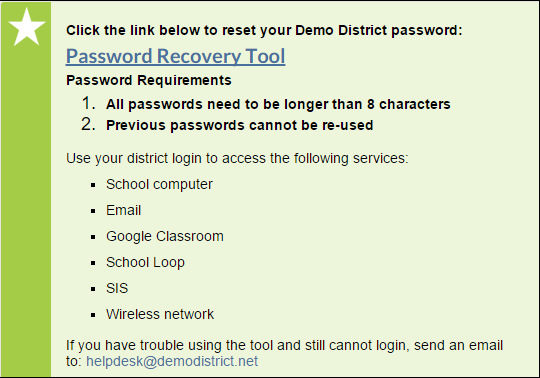 From your District Admin portal, navigate to the School Site List in your Toolbox and click the Password Help Message link. The web service fails to run with error "Could not find the main class com.ldap.service.ldapapp". In the command prompt, change directory (CD) to the "dist" folder before running the web service. A "command not found" error occurs when trying to create the keystore using the keytool command. This likely means that that java's bin folder is not in your system's PATH variable. Either add Java to the PATH variable, or run keytool with a fully-qualified path. The keytool utility is part of the java standard edition (SE); if you only have the java runtime (JRE), you may need to download the SE. The keytool.exe utility is in the java SE's "bin" folder.